With the holidays just around the corner, most of us will be spending, even more, time in the kitchen than we already do. During Thanksgiving and Christmas, it is probably the most used room in my house. My oldest kids are home from college, everyone is constantly raiding the fridge, and we love to entertain family and friends. So the kitchen is where it’s at. It is also, according to researchers, the dirtiest room in the house. Anyone who thinks it’s the bathroom is sadly mistaken. The Global Hygiene Council found that the kitchen drain, garbage can and kitchen table all contain more bacteria than a toilet seat — Yuck! Furthermore, a recent study concluded that the kitchen sponge is the No. 1 breeding ground for bacteria in your home. 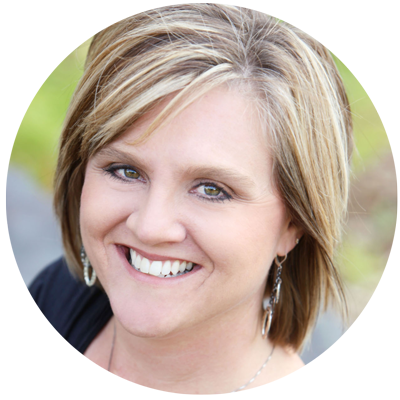 Other kitchen culprits are countertops, cutting boards, stovetops, ovens, refrigerators, and microwaves. Unfortunately, a piece of misinformation I also often hear is that chemical disinfectants such as bleach are the only effective weapons against harmful bacteria. 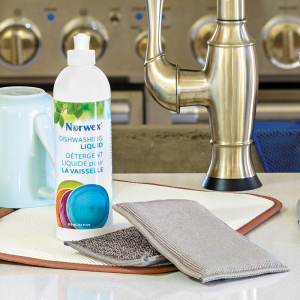 Having been on this journey with Norwex to reduce the number of toxic chemicals in my home for almost a decade, I can say with confidence that you do NOT need harsh chemicals for a spotless kitchen. 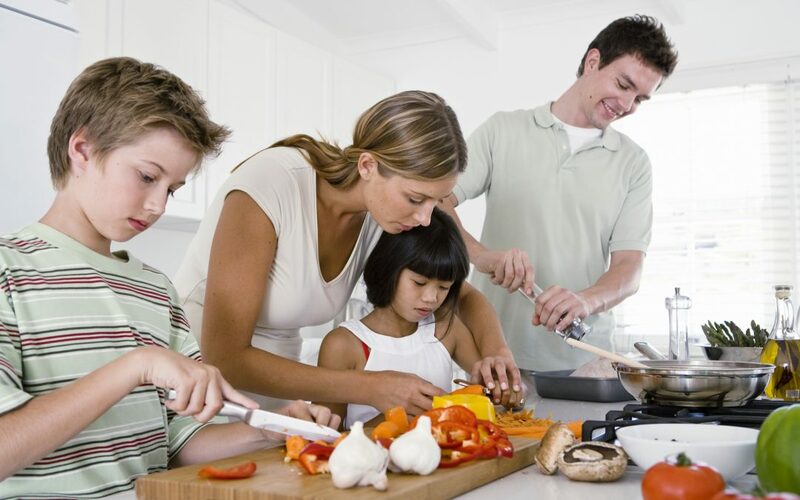 My kitchen has never been cleaner, and if I can do it — with five kids, on a farm — you can too! 1. Norwex Microfibers are your starting point. 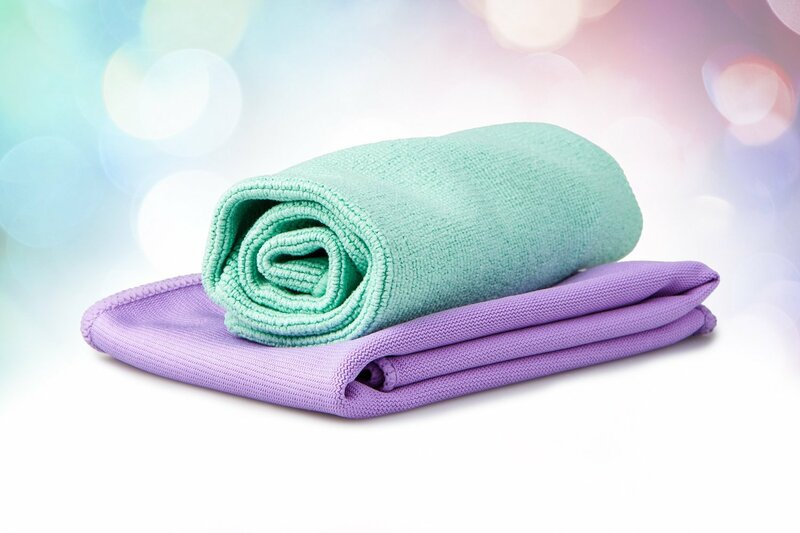 Norwex is the global leader in microfiber technology and a unique knitting process, allows our ultra-thick and absorbent cloths to pick up the smallest particles of dirt and trap them. So, when following the proper care and use instructions, they can remove 99 percent of bacteria from a surface without the use of chemicals. Plus, most of our microfiber products are made with Baclock, an antibacterial agent made from silver (read more about the power of silver), that is used for self-cleansing and inhibits bacteria, mold, and mildew from growing in the cloth. Fold an EnviroCloth or Kitchen Cloth into quarters so that you have eight clean sides to work with and you’ll quickly get through wiping down most of your kitchen surfaces before even having to rinse. When you are done, rinse your cloth with a small amount of detergent before hanging it to dry. (I prefer a sprinkle of Norwex Ultra Power Plus Laundry Detergent.) Launder as needed. 2. Tackle your stovetop and oven. 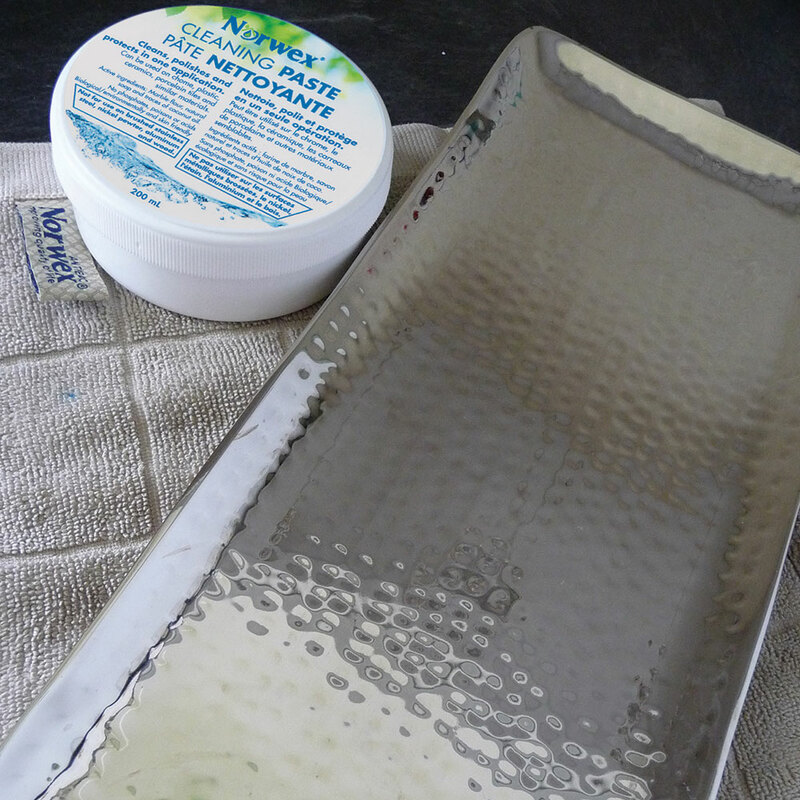 I use a damp microfiber to wipe off my stovetop and the inside of my oven after use and polish my stovetop with the Norwex Window Cloth for extra shine. After a major cooking event like Thanksgiving, I recommend spritzing your oven generously with the enzyme-based Norwex Oven/Grill Cleaner. 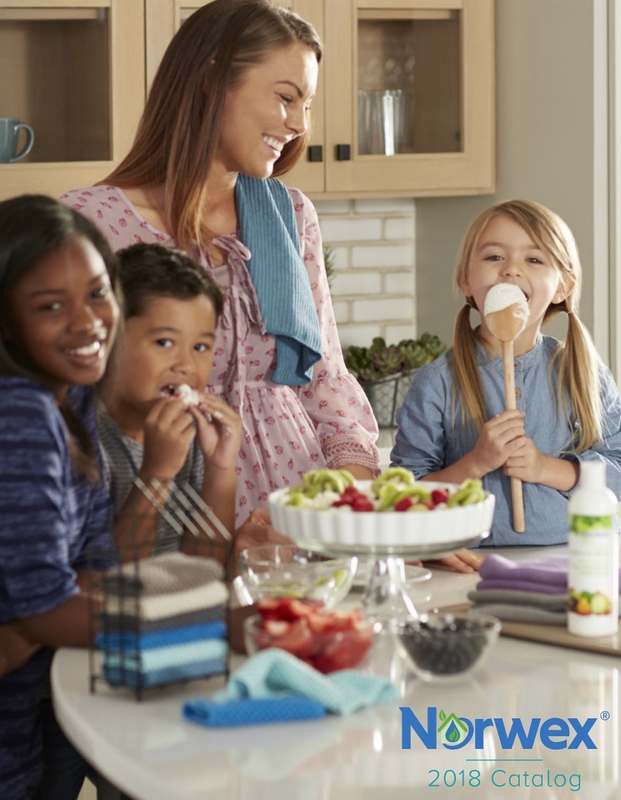 Let it sit while you go to work on the stuck-on food and grease on your stovetop with a dab of Norwex Cleaning Paste, which is made from an environmentally-friendly mix of marble flour, natural soap and coconut oil. Once the stovetop is sparkling, go back and wipe down the oven. 3. Steam your microwave. Every couple of weeks I’ll mix one cup of vinegar with one cup of water in a microwave-safe bowl and heat it up for about five minutes. The steam this creates effectively loosens any grime or gunk on the inside of the microwave that I can easily wipe away with my microfibers. 4. Empty and wipe down your refrigerator. I regularly go through and throw away any old food, organize fresh food and wipe down the shelves with my damp microfiber. Once the fridge is immaculate, I really feel like my kitchen is clean! 6. Give your sink and garbage disposal a thorough cleaning periodically. I like to tackle the disposal every couple of months. I pour a halfcup of baking soda down the disposal and add one cup of white vinegar, let the mixture fizz for a few minutes and then pour boiling water down the drain. When I’m cooking with lemons or oranges, I’ll throw the peel in the disposal to keep it smelling pleasant.I wipe down the sink daily with my EnviroSponge, which has the advantage of having a scrubby side and an EnviroCloth side. For tough stains, I’ll use a bit of Cleaning Paste to scrub away the marks. 7. Give your countertops some love. I wipe them down with my damp microfiber and pull out my EnviroSponge or some Cleaning Paste for stuck-on gunk. 8. Go over those floors with your microfiber mop pad. Be sure to get all the nooks and crannies! 9. Take out the trash. Then, spritz your trash can with Norwex Odor Eliminator so that your sparkling kitchen also smells fresh! 10. Admire your beautiful, sparkling and safe kitchen!